Belden Town Resort is located on the Pacific Crest Trail and when hiking North, Belden comes close to marking the halfway point on the trail. We stock our general store to hikers needs and requests offering everything from fuel canisters, post cards, a variety of beverages, toiletries and lightweight snacks including protein bars, trail mix and candy. If you are a hiker and have any suggestions on things you would like to see our store carry, feel free to email us at beldentownresort@gmail.com. Please note that Verizon and Sprint are the only two cellular networks that work here at Belden. 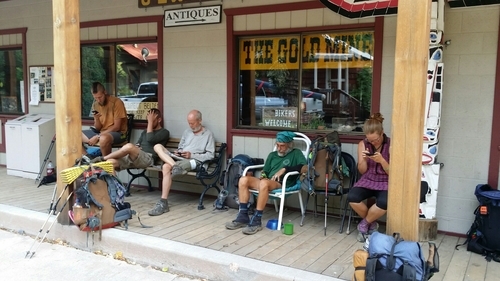 We do offer limited free Wifi for hikers in the lodge. The satellite internet does not provide fast enough service to place phone calls, Skype or stream video however these work great with the cellular networks. We are located approximately a quarter of a mile from the Braaten's Little Haven trail angel. We also have a full bar and restaurant that offers breakfast, lunch and dinner. We are sure you'll be hungry when passing by so try our Belden burger designed specifically for the hungry hiker! Shower and laundry is available on site as well. Happy trails and we all look forward to seeing you soon here at Belden Town!